These excerpts from New Musical Express, kindly selected for 'Beyond the Pale' by Yan Friis, provide an evocative summary of the pop-music climate into which Procol Harum emerged. 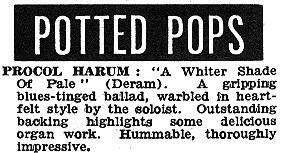 This little review and advert must be among the earliest printed references to A Whiter Shade of Pale. Front page: a full page advertisement for John's Children's new 45: Desdemona (picture of the young Marc Bolan and all). Dave Dee, Dozy, Beaky, Mick & Tich, Okay! Procol Harum: A Whiter Shade Of Pale (Deram). A gripping blues-tingled ballad, warbled in heartfelt style by the soloist. Outstanding backing highlights some delicious organ work. Hummable, thoroughly impressive. There was also an advert: not big, but still. It was placed in the middle of the centre spread news pages.